In contrast to the first video, this next one from Romita, Guanajuato is equally strong in terms of the quality of the music and dancing, but somewhat wilder due to an emphasis on the antics of the Feas and a Diabla. The wife of the Hacendado is portrayed in this version with a wrinkled face and she wears a floor length skirt. Three of the Romita “women” with very short hemlines are portraying Borrachas (drunken women) and more generally they are called Feas (female feos), while the one who has a short hemline plus horns is a Diabla (female devil). These female characters are definitely portrayed by men, because traditionally no respectable woman would dress or behave in this manner, particularly as found in the Romita performances! As you can see, he reports that he took on this role without much reflection. 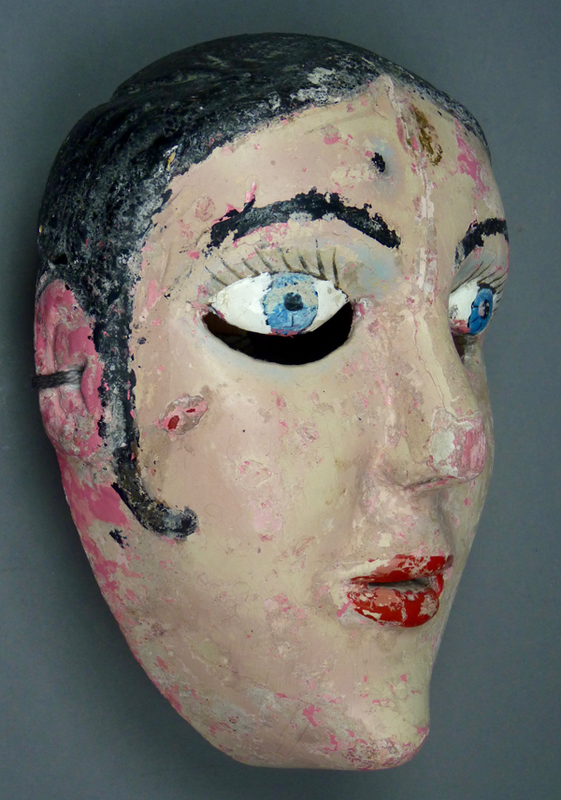 Over time he became increasingly invested in this performance personality that he was essentially creating—an idealized feminine personality who pretends to kiss everyone within reach with her wooden lips. As he described his experience, there is a place in the video when he became visibly tearful, which made me curious. Although I am uncertain about what he means when he speaks of “losing the Diabla,” it is difficult to escape the impression that this role allowed him to experiment with important identity options. More generally, his remarks suggest that although the Diabla and Fea labels may have long ago been invented to illustrate earlier Christian teachings about morality and immorality (do this and not that if you value your soul), the present meaning of these performances is in flux, possibly moving towards pure burlesque versus an emerging gender fluidity or freedom that can be tried on in these roles. “El Caporal is the ranch foreman. He is sometimes referred to as La Mulita or ‘the mule’. He is the second in command at the ranch and is in charge of daily ranch operations. He is very crude, macho…” In the videos there are two of these Caporales, who appear to be twins with stark white faces. They carry bullwhips and whip not only all those around them but also each other. That there are two Mulitas may be a modern variation. “La Borracha is the ‘criada’ or servant of the hacienda. She observes the actions of La Maringuia and tries to imitate them so that the bull will leave La Marinquia alone but in her state of drunkenness she fails.” There can be two or more contrasting Borrachas in these videos (three in the Romita video, not counting the Diabla). 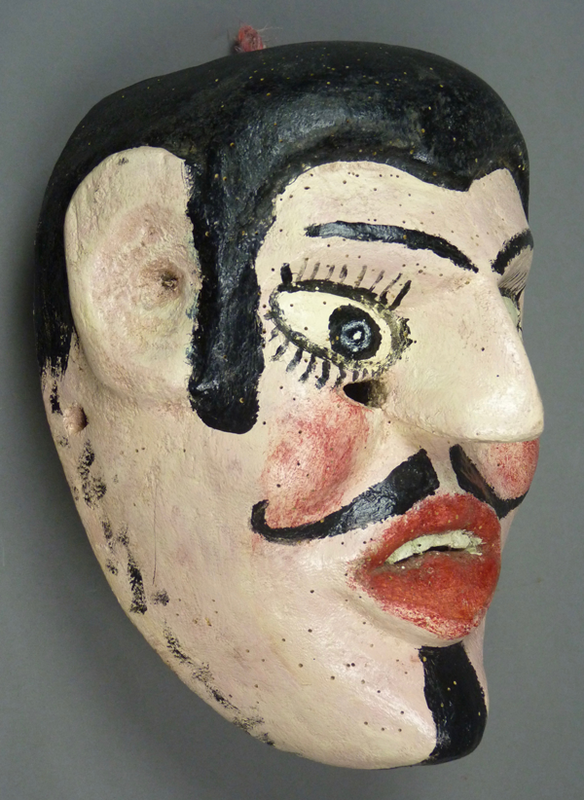 “El Jorobante is the hunchback and is the husband of La Borracha. He is also sometimes called ‘El Jorobado’ and also ‘El Moco’. The word ‘moco’ in Spanish is associated with mucous or nasal snot but a ‘moco’ is also the protuberance that hangs down between the eyes of a turkey. That is why the mask of ‘El Moco’ is a long triangular shape with what looks like an elephant’s trunk hanging down from between the eyes.” I have seen photos of these strange masks without any knowledge of their identity or purpose, until now. “El Ermitaño is the old man. 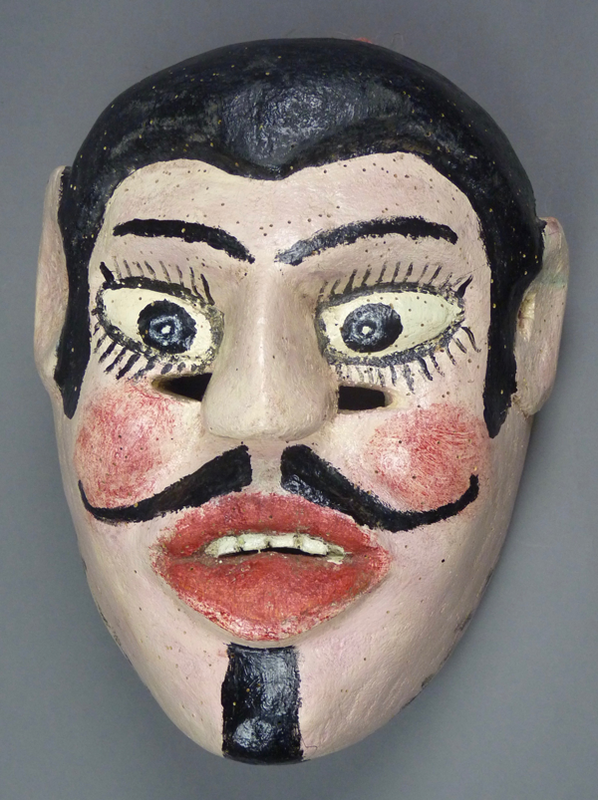 He is also sometimes called ‘El Viejo.’ He carries a cane, a crucifix and a rosary and represents the religious people who believe that with prayers and supplications they can tame the beast.” You have seen this character and these masks before in the Pastorela and again in the Danza de los Viejos. “The Devil represents evil in person.” He too carries a whip. “The Apache appears in some versions. He represents the indigenous past of the Mexican people.” He doesn’t appear in the Silao and Romita videos. “La Muerte or ‘Death’ also appears in some versions. Death represents the truth, that in the matter of life and death, it doesn’t matter if one is poor or rich, or good or bad, or beautiful or ugly, all have to die. The bull kills everyone and then Death kills the bull…” In these dances Death carries a scythe. Thanks again to Mexico Bob! In La Muerte en las Danzas Mexicanas: Collección de Máscaras de Estela Ogazón (2005, pages 25 to 27), there are undated dance photos from Purisma de Bustos, Guanajuato related to the Danza del Torito in that region. 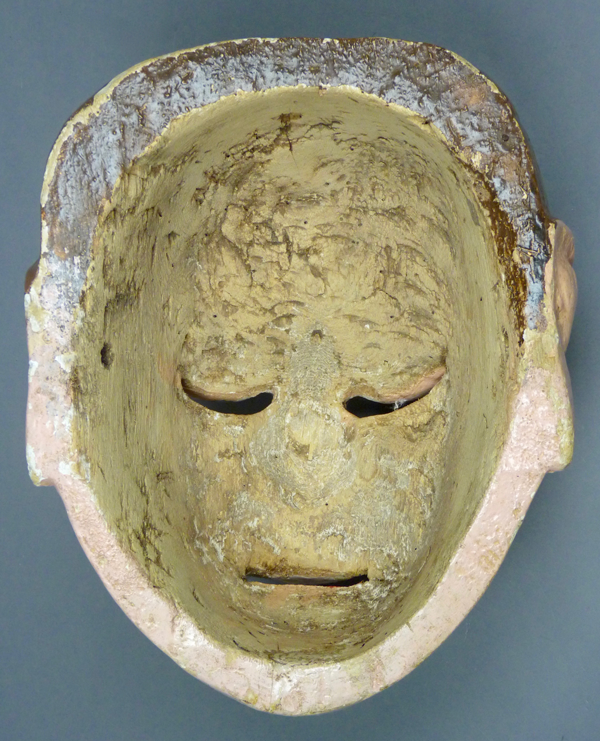 Jaled Muyaes himself appears in one of those photos holding a female mask. In that book there is a photo from Charo, Michoacán of Death carrying a scythe. 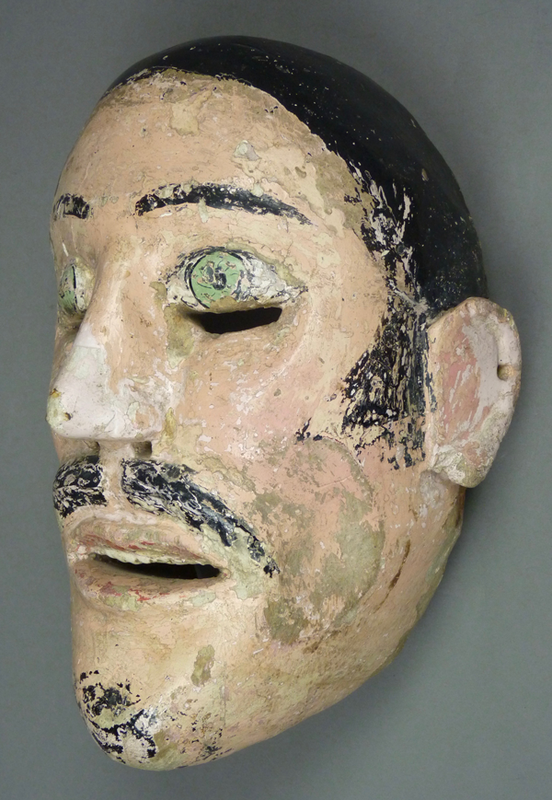 In Mask Arts of Mexico, by Ruth Lechuga and Chloe Sayer, there are several older masks from the Torito dance in Guanajuato. 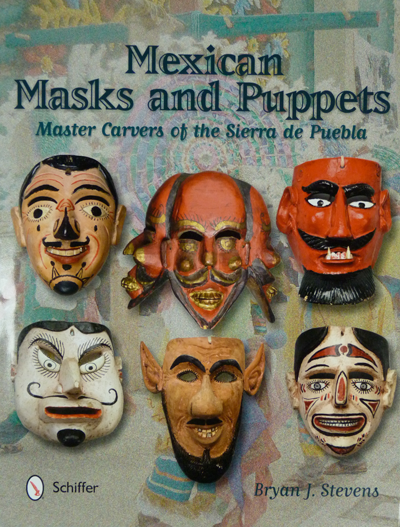 On page 19, the third mask down on the left side appears to be a mask of the Hacendado while the middle mask in the bottom row may be a more recent example of the same mask. 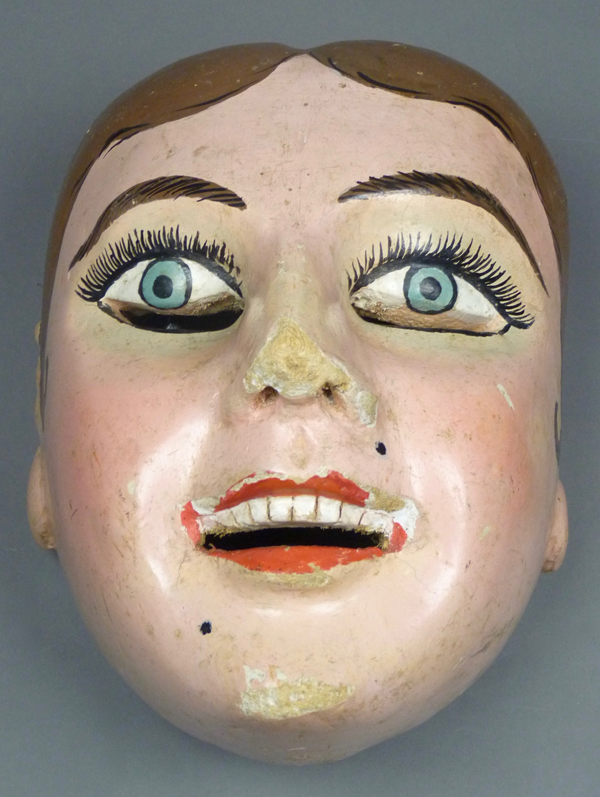 On page 42 we find three older female masks from that dance, all said to be worn by Borrachas, the reckless free spirits with short skirts in the Romita video. I greatly admire the mask on the lower left, which appears to be by the same hand as my Bonita mask. 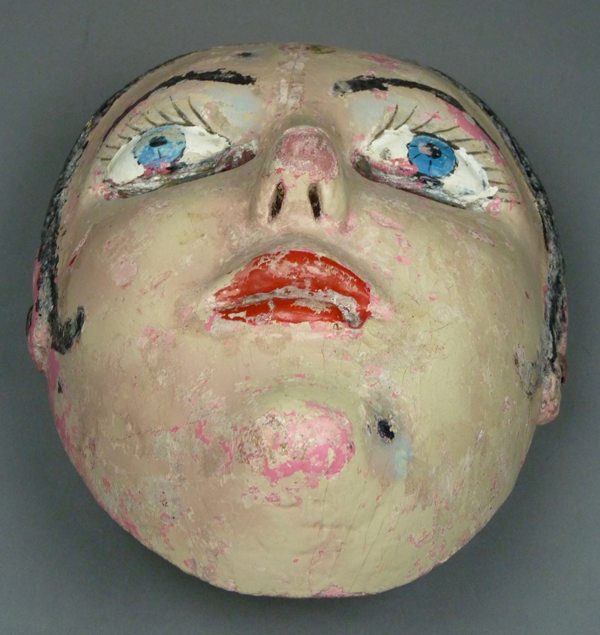 Now we can look at some individual masks, beginning with Maringuía or La Bonita, the wife of the Hacendado. Her mouth is so expressive. 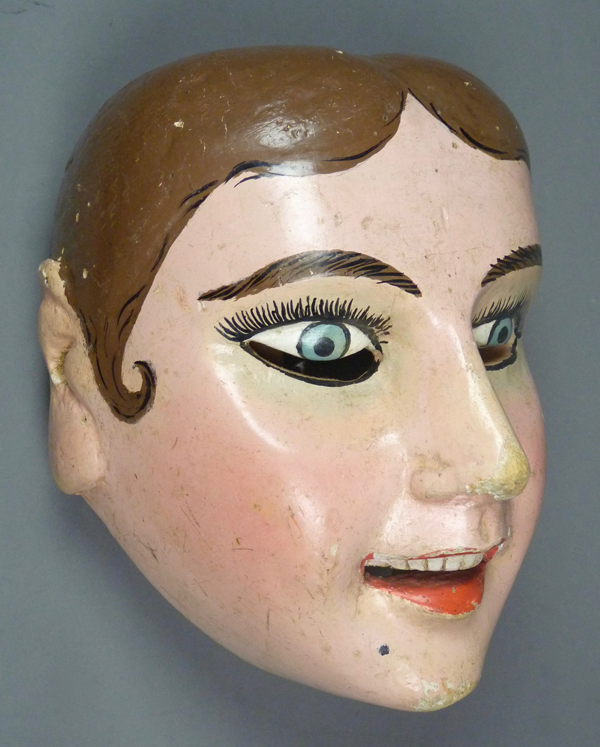 Remember that this mask and the three that follow probably date to the 1950s or 60s, many decades earlier than the style seen in the videos. 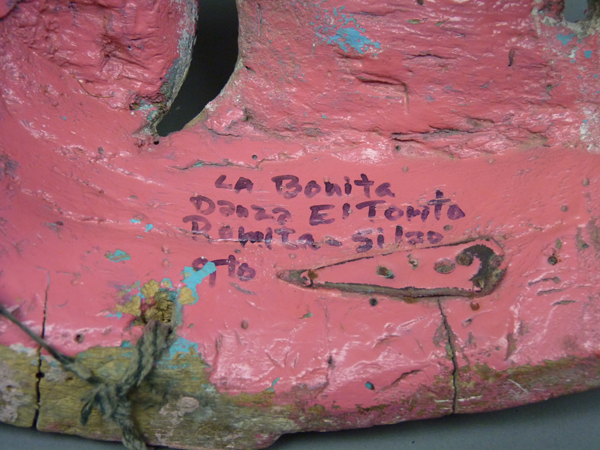 Her last paint layer was hot pink, and someone has flaked that paint off to reveal the previous layer or layers of tan. The hot pink remains around the ear. 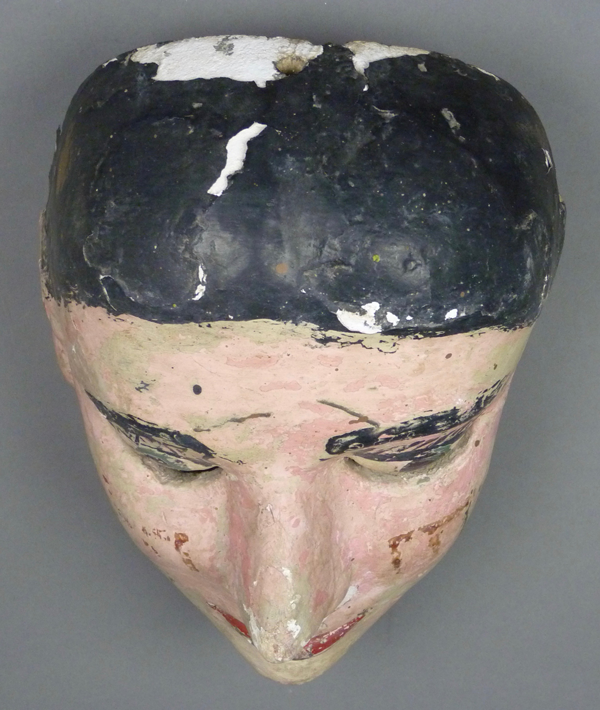 The paint is really old and worn on the top of the head. 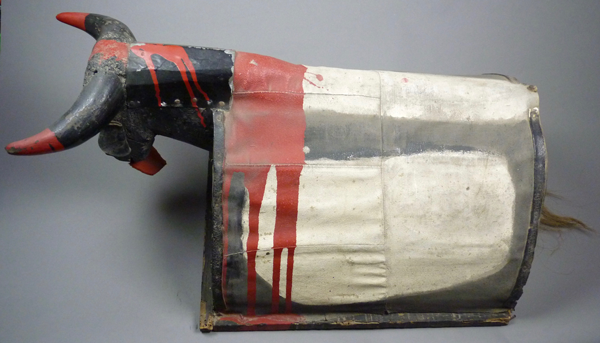 There are several leather patches nailed to the back to stabilize cracks. 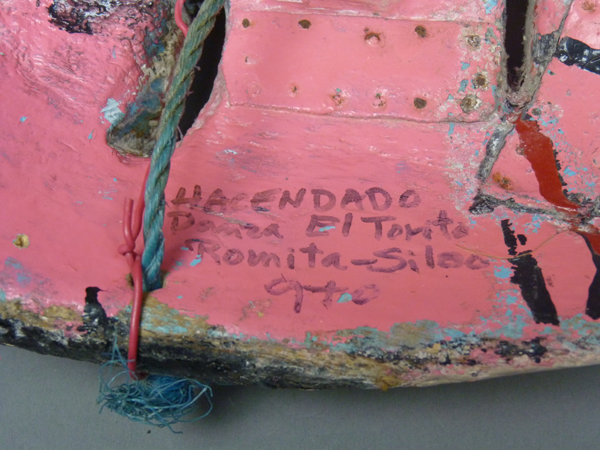 Someone labeled the back with a marker—La Bonita/Danza El Torito/Romita-Silao/Gto (Guanajuato). Here is the Hacendado. He too has layers and layers of paint. He too has a somber expression. In the dance, these characters are being threatened with death by a terrifying runaway bull. 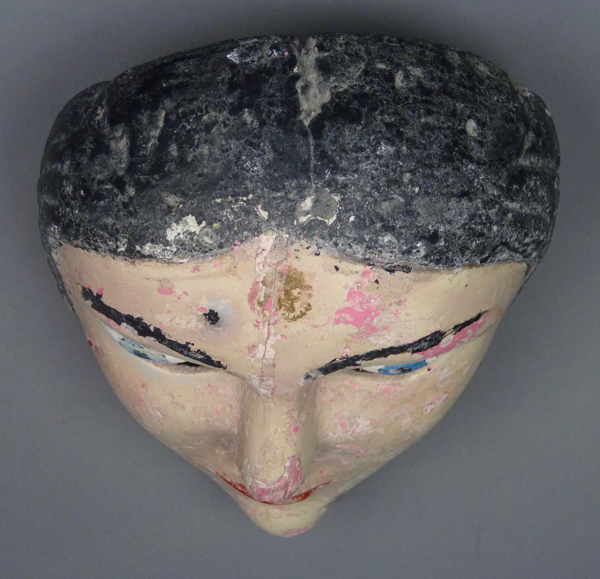 The paint on the top of his head is neglected and deteriorating, like that of La Bonita. The lighter pink on his nose was exposed as the tan layer was worn away by use. 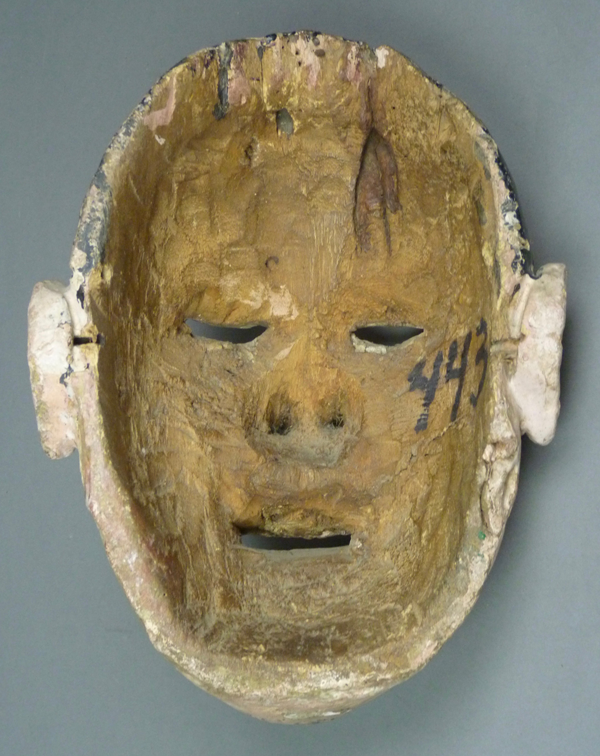 This mask is 9½ inches tall, 7 inches wide, and 4½ inches deep. 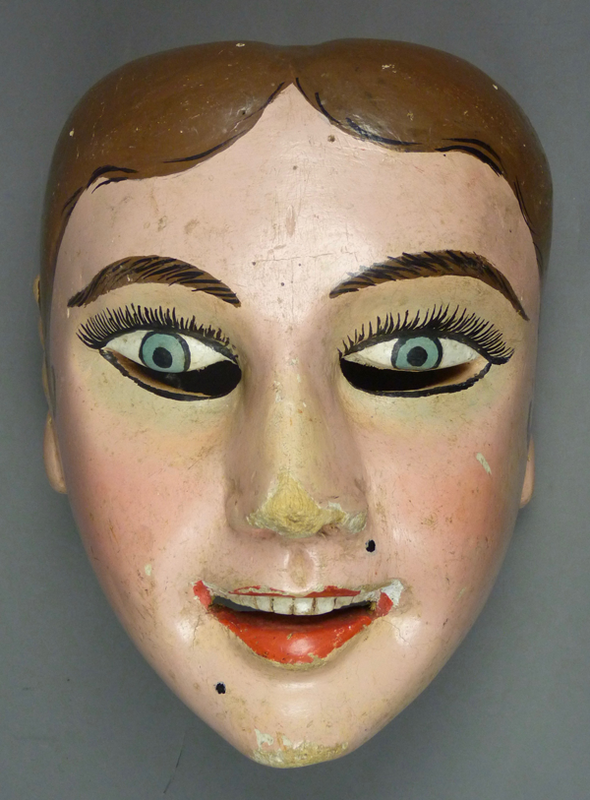 There are also nailed on leather patches on the back of this mask. This one was similarly labeled. Next is a Borracha mask, one of a second pair. 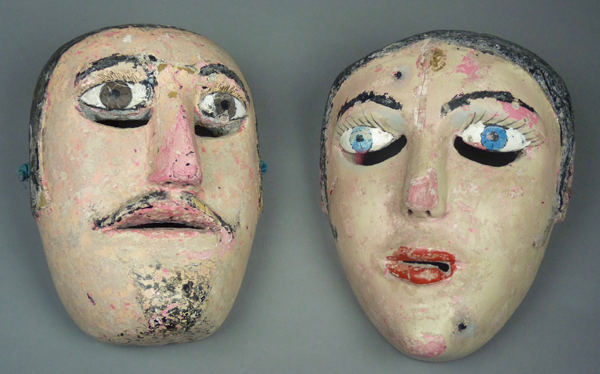 I bought these masks from Jaled Muyaes and Estela Ogazón in 1997. 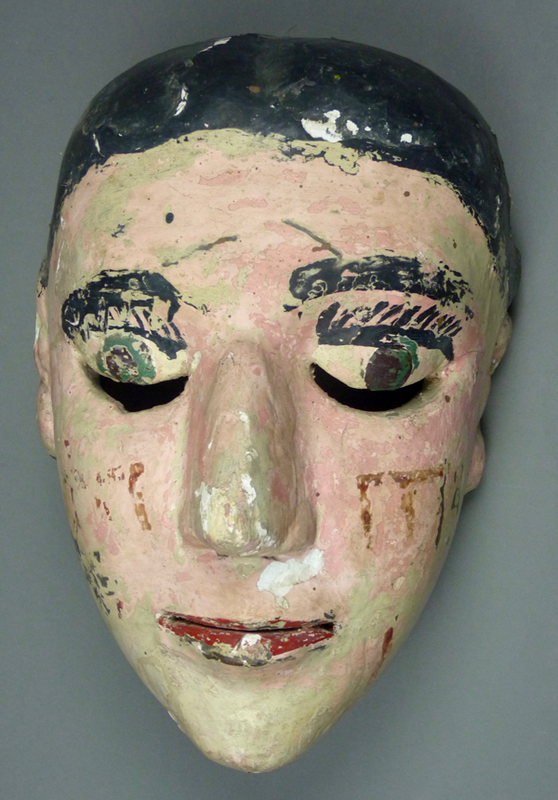 The bleeding wounds confirm the identity of this mask as the one worn by the Borracha. It is implied that intoxication leads to brawling and injury. The ear on this Borrracha mask is delicately carved. 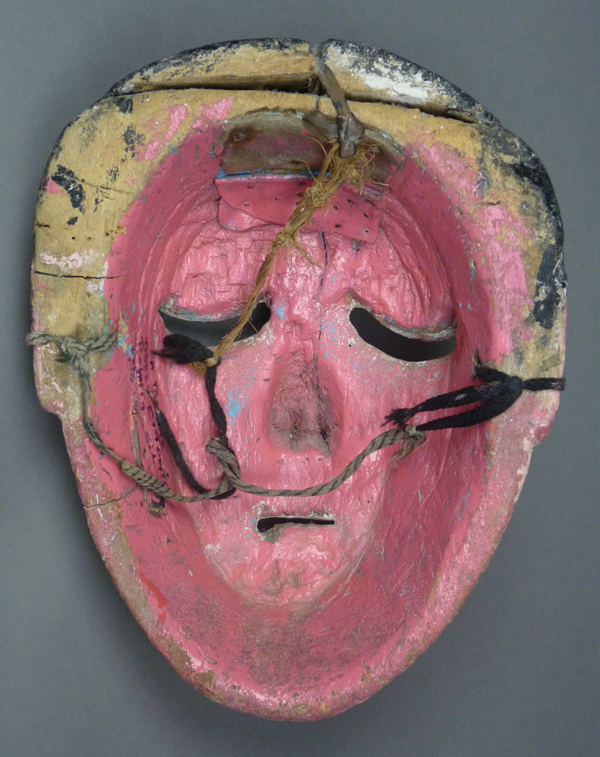 The old paint on this mask is fragile. 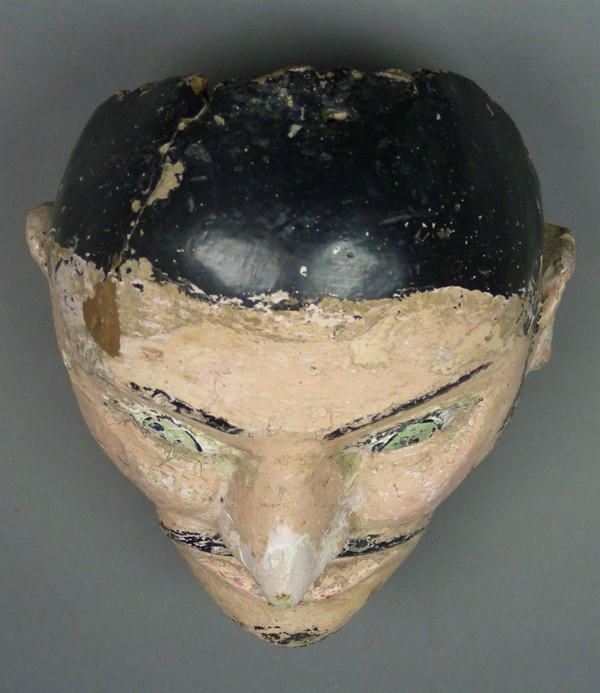 This mask is 11½ inches tall, 8 inches wide, and 5 inches deep. 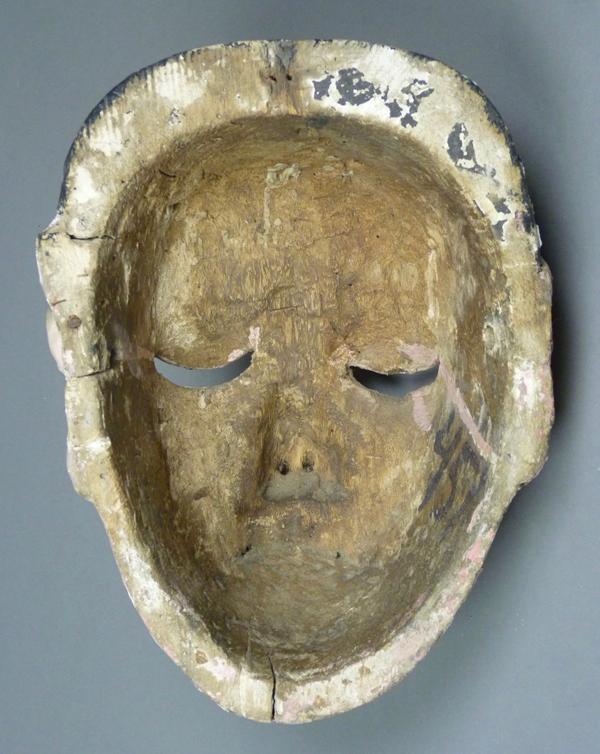 This mask and the next have heavy staining from use. Also note that both have numbers on the back that indicate their appearance in the 1981 show in Mexico City. This is the mask I purchased with the Borracha mask. 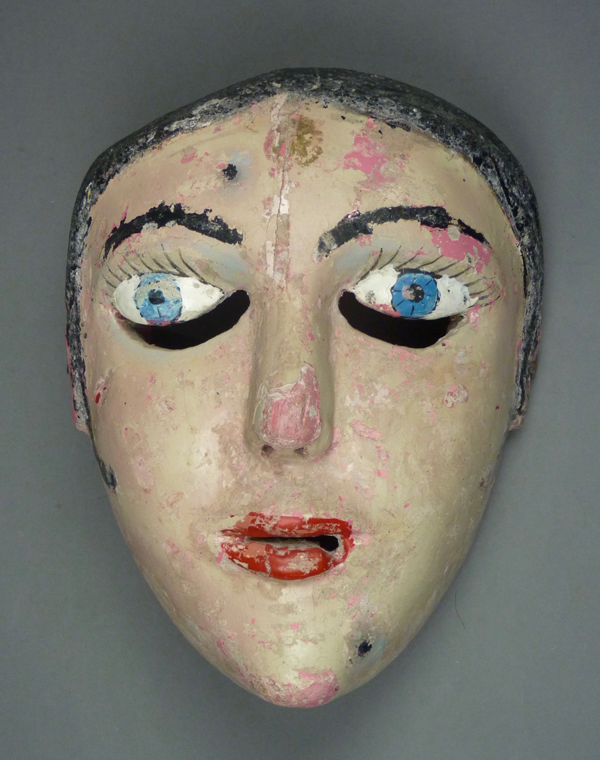 I am guessing that it was worn by the Caporal, but it may be another Hacendado mask. I particularly like the hollow cheeks on this mask. The Borrracha and this mask have green eyes. 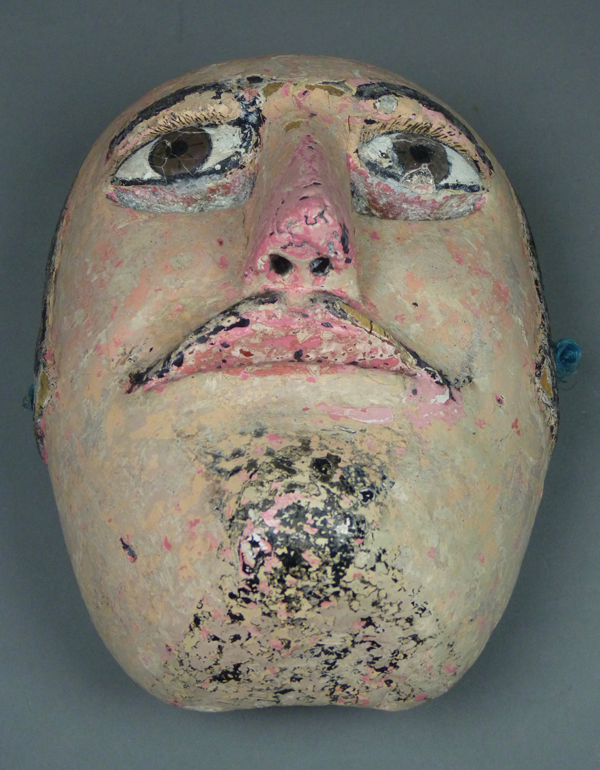 This mask is 11 inches tall, 8 inches wide, and 5 inches deep. 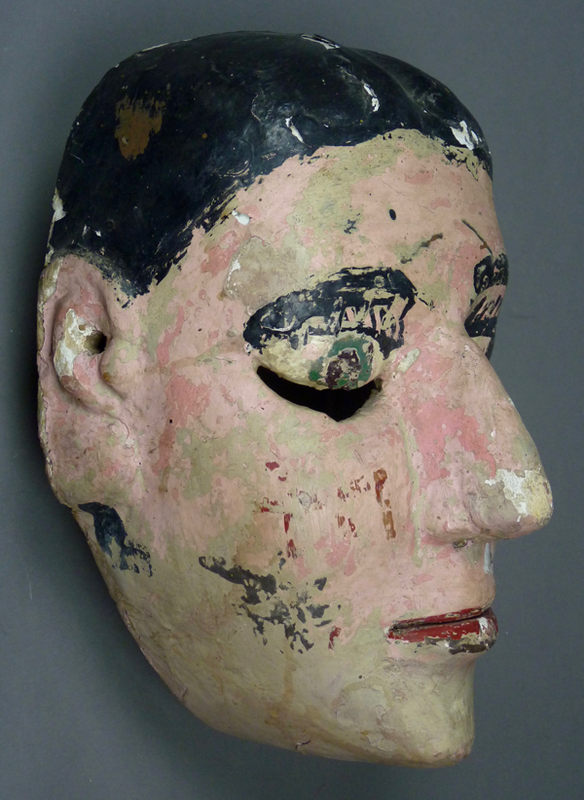 The back of this mask is old and worn. Here is a more modern Borracha that I bought on EBay™ in November 2017, less than a month ago. It came with little provenance, yet it is easily recognized because of its form, its exceptional size, and most particularly from the design of the back. Just compare the back view of this mask to the backs of La Bonita and La Borracha and you will see what I mean. I am guessing that it dates to the latter 20th century. 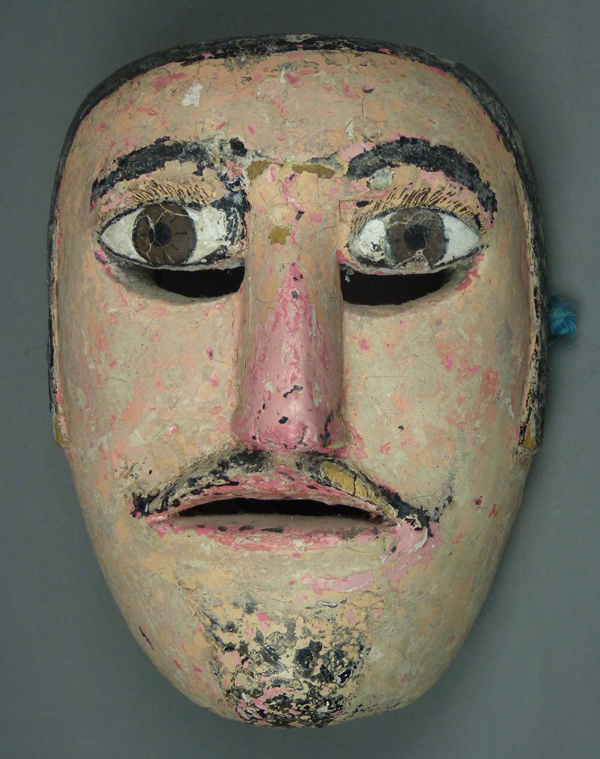 These modern Borracha masks lack the stigmata (such as bleeding wounds) that characterized earlier examples. 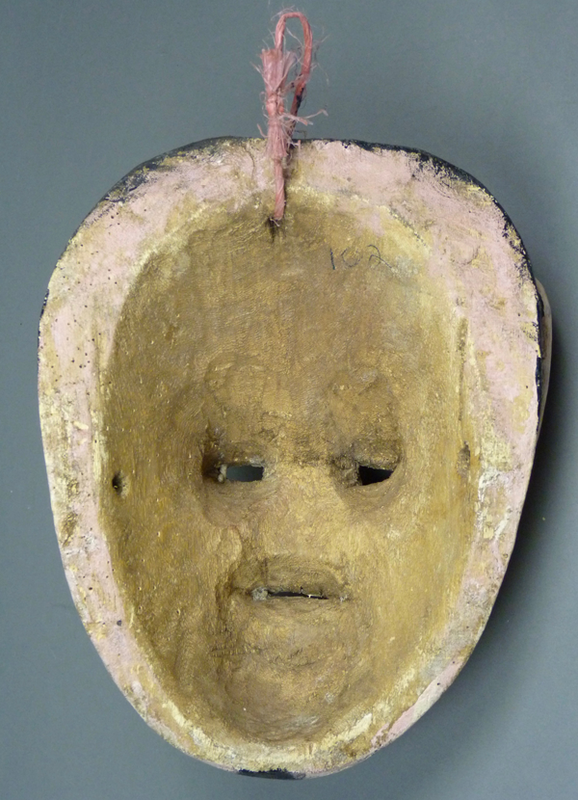 On the other hand, the nose and mouth of this mask are damaged, and after viewing the Romita video we can explain that finding—this mask was worn by one of those Fea “girls” who jump into the laps of bystanders in a vain attempt to escape the bull. On such a character, a mask will receive rough treatment! In contrast, La Bonita’s behavior is far less impulsive or daring, as demonstrated in both of the introductory videos. The ears are elaborately carved. 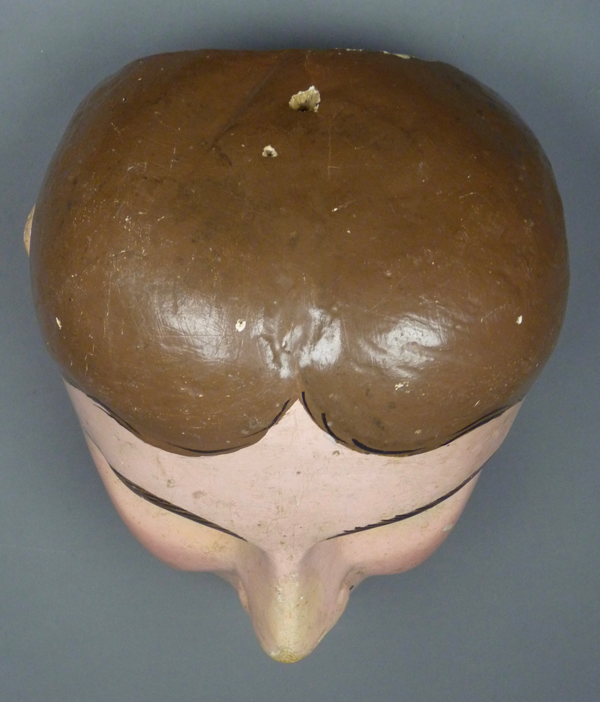 The feas in the Romita video have prominent cheekbones like those on this mask. I am referring to the semicircular shelf in front of the left eye, a feature seen even more starkly on those Fea masks. The tip of the nose, the upper lip, and the chin are scuffed. 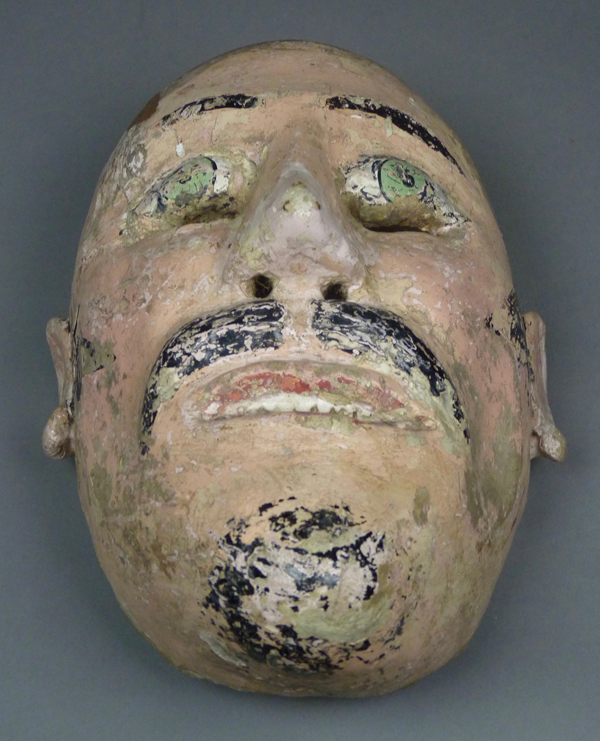 This mask is 11 inches tall, 8¼ inches wide, and 6½ inches deep. I bought this next mask on EBay. It came with an old tag from the Mano Magica gallery in the city of Oaxaca, which stated that it was from Silao, Guanajuato. 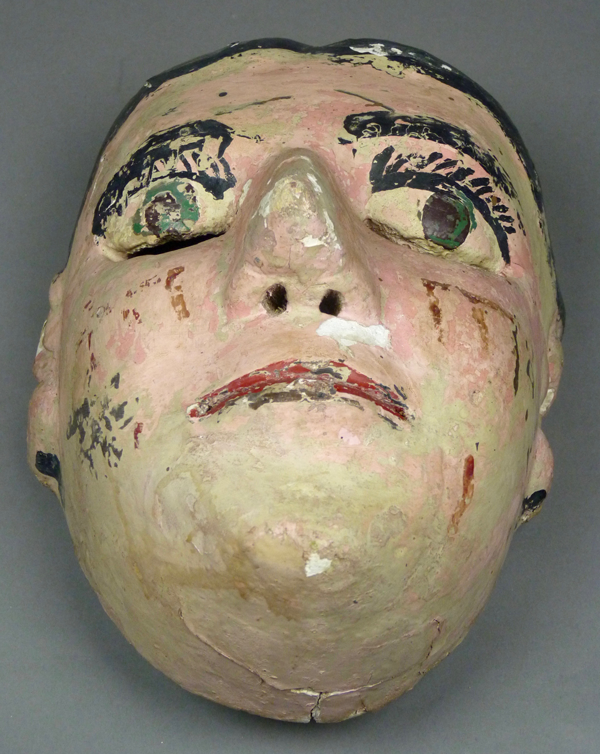 Mary Jane Gagnier de Mendoza, the owner of that gallery, generally obtained masks used in other Mexican states from Jaled Muyaes and Estela Ogazón. 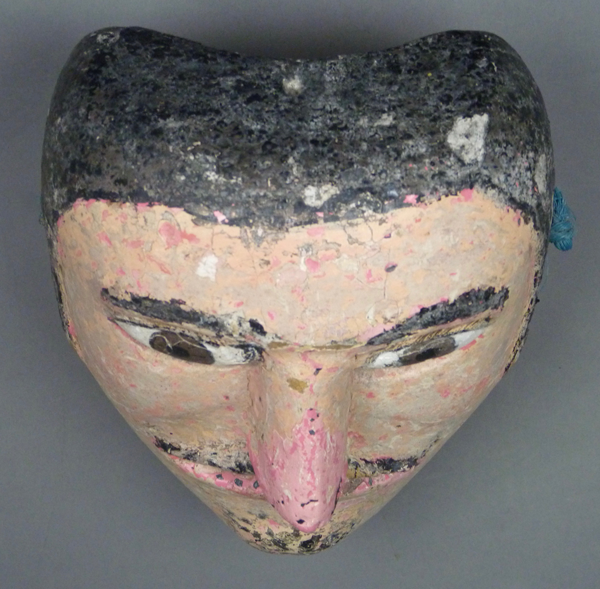 This would appear to be another mask of the Caporal in the Torito dance of Silao. 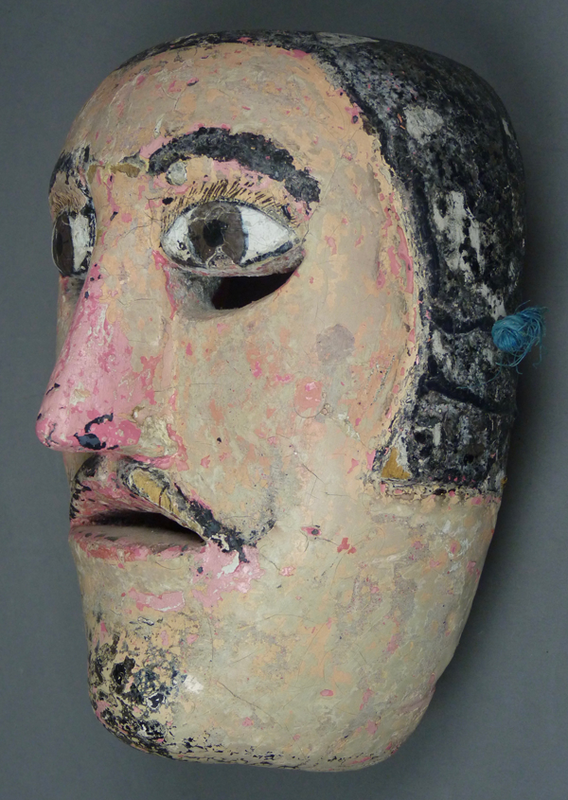 This mask is more recent than the quartet that opened this post. 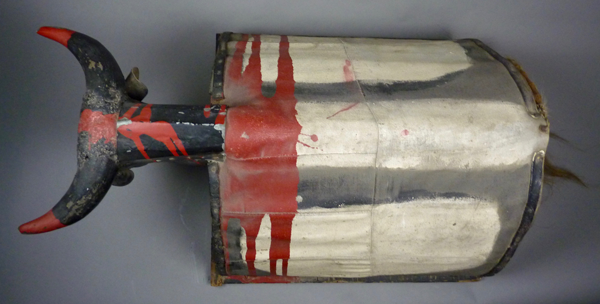 It is 10 inches tall, 8 inches wide, and 4¾ inches deep. This mask has mild to moderate staining from use. 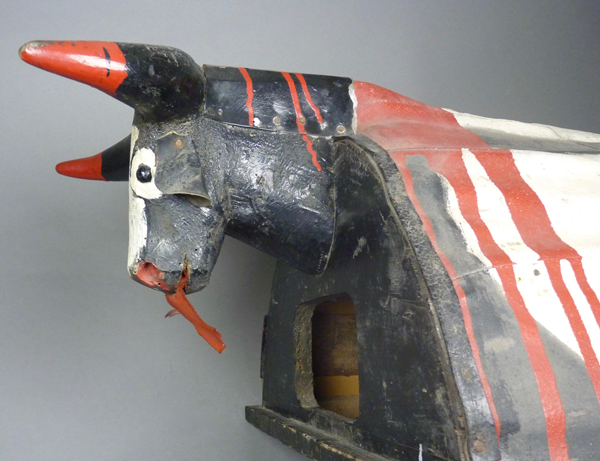 Finally, here is the body mask of a bull that is worn over the head and shoulders by the Torito dancer. 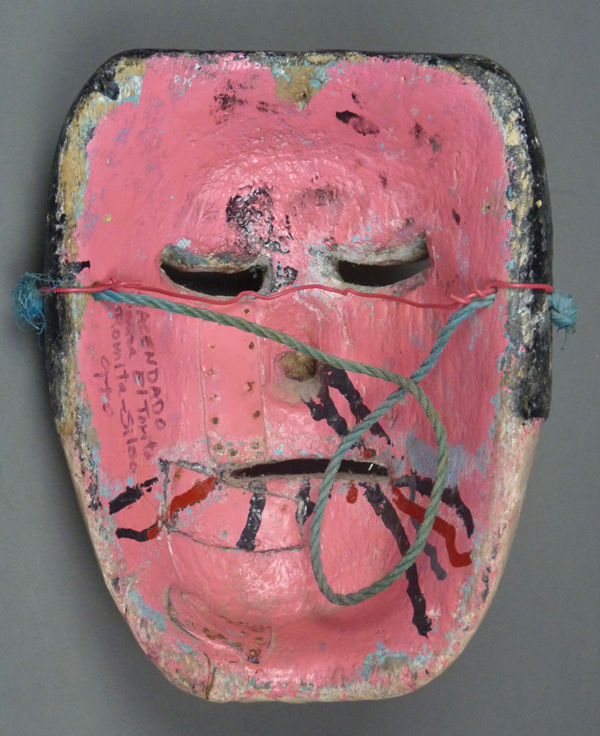 I obtained this mask from Jaled Muyaes and Estela Ogazón in 1999. They had collected it in Silao, Guanajuato. It has a wooden frame that is covered by painted canvas. There is a pillow inside to soften the burden on the wearer’s head. The dancer has what amounts to a porthole that allows him to see out from inside the structure. 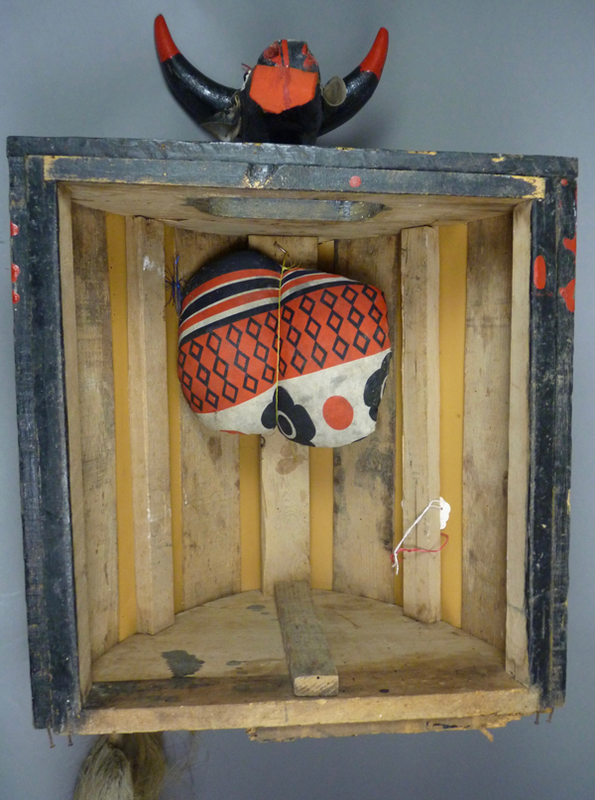 In one of the videos the dancer has stretched cloth over the bottom of the frame, that cloth cushions the weight on his head, and he peers ahead under the front edge of the “mask” rather than through the porthole. 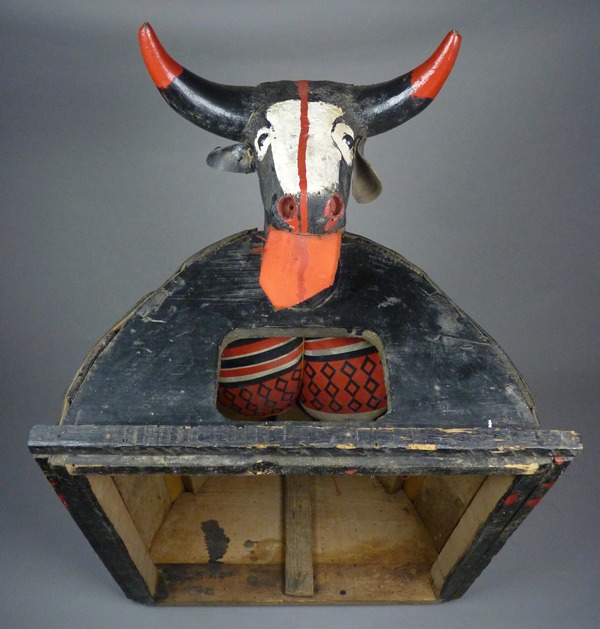 A carved wooden bull’s head is securely mounted on the front of the frame. The bull has a large leather tongue. 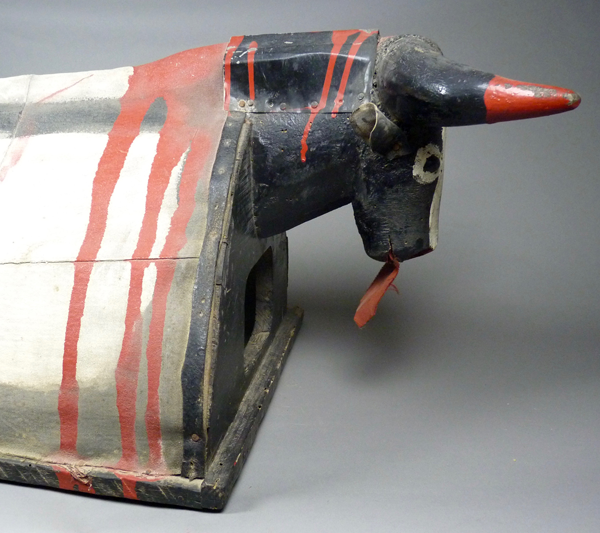 A top view of the Torito. 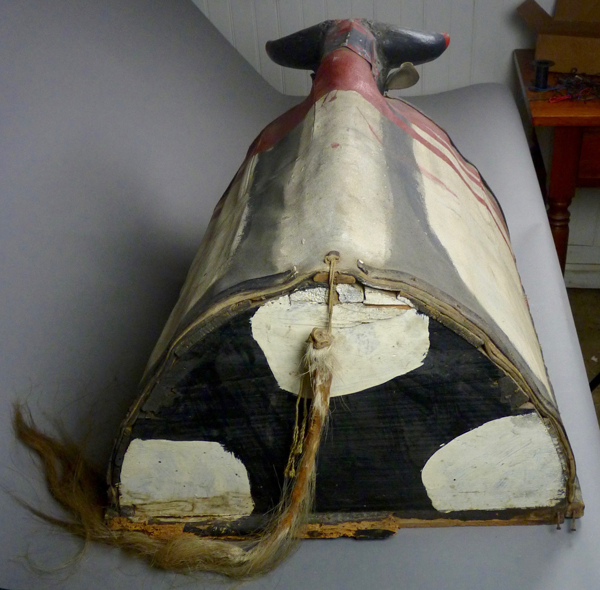 This bull is 28 inches long, 18½ inches wide, and 14 inches tall. The rear view with a hanging tail. I hope that you have enjoyed learning about the Dance of the Torito. 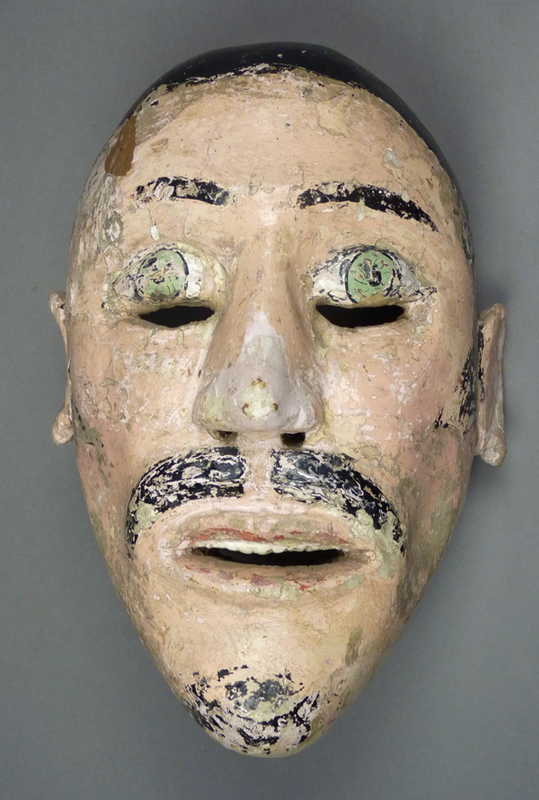 Next week I will begin a new series of posts about the Tlacololero masks from Guerrero.